The walking tour starts at the North End of town and follows the canal route south to Beaverdams Park. To use the guide simply click on the map to jump to a short description and picture for each item. 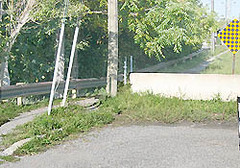 Second Welland Canal: If you read the forward and history for Thorold you'll remember that the Second Welland Canal was covered up and currently runs underground. You can still see the canal water emerging from a culvert on the north end of the city. 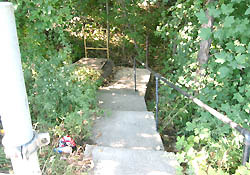 The Stairs: There's a ominous set of stairs going down to the culvert. Sorry just adding to the suspense. The Culvert: Again for the record this is the Second Welland Canal water emerging from Thorold. Technically this location is already in St. Catharines and the water is heading toward another historical canal site, Mountain Locks Park. 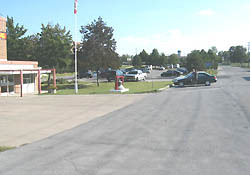 Lock 22 - Today: The photo at right shows the actual route of the Second Welland Canal. The thing to appreciate is how open the canal route remains through town. 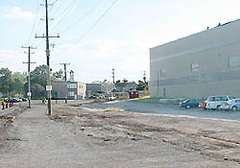 The building ahead is one of the few that have been built on canal land and most like likely sits near Lock 22 of the Second Welland Canal. MapleHurst Mansion: When William Hamilton Merritt formed the Welland Canal company in the 1820's he did it together with another mill owner, George Keefer. 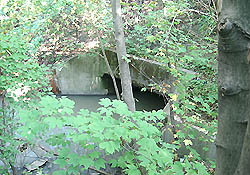 Keefer originally owned the land from the culvert up to and including Lock 23. 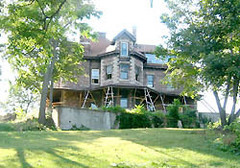 In 1886 his son Jacob Keefer built a huge mansion on the hill overlooking the canal. The house was recently restored and still looks impressive. Canal Route: Again it's still easy to follow the route of the canal through Thorold. 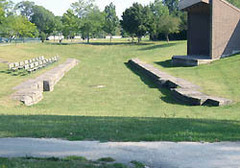 The area in the picture was once the channel leading up to Lock 23. It was being landscaped when the picture was taken in 2004 and looks a lot more cleaned up today. 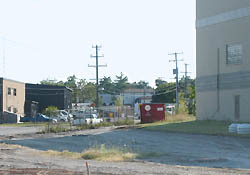 Lock 23 - Today: One exception to the lack of development was the building on the right of this photo. It was an addition to a paper mill that has since gone out of business. Apparently the corner of the building in the picture is built right on Lock 23. Canal enthusiasts protested the building permit, but were unsuccessful. Narrow Squeeze: Of course the addition to the paper mill narrowed the open area of the canal route. If you look straight ahead you'll see that the route continues ahead. 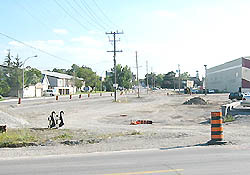 The area ahead was Thorold's downtown area where a harbour existed along with several mills. The route is fenced off at this point but it's easy to just walk up Front street and loop around to the other side of the fence. 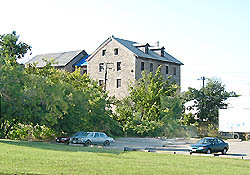 Welland Mills: Built in 1846 this mill is one of the oldest if not the oldest remaining structures along the canal. When it was built it was also the largest flour mill in Upper Canada. The building has a unique architecture and fortunately was recently restored and used for as an apartment building. 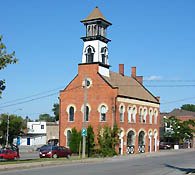 Old Fire Hall: This unique and beautiful building on the north side of Albert street was Thorold's firehall from 1877 (possibly 1878) until 1964 when the current firehall was built across the street. It's proximity to the canals made it a feature of many early canal pictures. 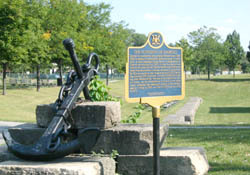 Thorold's harbour, an area where docks were built along the canal, was right here as well. Beaverdams Park: The rest of the channel route was turned into the Battle of Beaverdams Park. As you can imagine the park is a long and narrow one and takes a winding path to the south end of town. 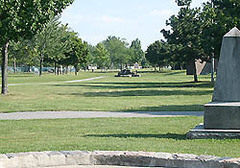 The park itself is a historical park and the final resting place for soldiers who died in the Battle of Beaverdams. Canal Route II: The park provides another clear look at where the Second Welland Canal once went. Far ahead the channel meets up with Ormand road and turns right where it continues south and out of the town of Thorold. Up ahead you can also see our last stops on the Tour. Plaque: The Founding of Thorold: During the construction of the original Welland Canal. 1824-1829, a number of communities sprang up along its length. Here, on land belonging to George Keefer, a village known as Thorold had developed by 1828. 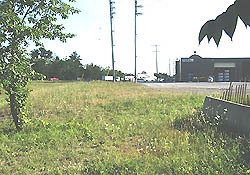 A large flouring mill was built on the canal and the Thorold Township post office was moved from Beaverdams to the new settlement by Jacob Keefer. By 1831 two sawmills were in operation and in 1835 the village contained 370 inhabitants. During the 1840's the building the Welland Mills, then one of the largest flour mills in Canada, and the establishment of Ontario's first cotton factory, stimulated the communities growth. 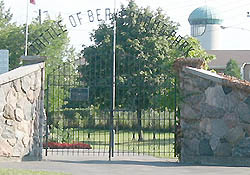 It was incorporated as a Village in 1850, as a Town in 1875 and as a city in 1975. Lock 25: With all the emphasis on cleaning up the canal it may come as a surprise that one of the locks is still visible. Lock 25 sits right in the middle of Battle of Beaverdams Park. Metal Brackets: It's actually the top layer of the lock that's been left exposed. 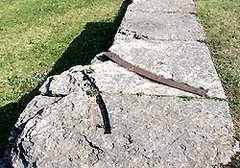 Here you can still see one of the metal brackets that was use to hold the lock's gates in place. The indentation of a second bracket can also be seen in the stone.